On 17 November 2018, when the Sentinelese of the Andaman archipelago killed an unwelcome intruder on their island—26-year-old John Allen Chau, an American missionary—it set off a global media frenzy. Journalists from across the world wanted to know more about the “uncontacted" Andaman tribe that has tried hard not to have anything to do with the rest of humanity. Who are they? Why do they do what they do? Genetic scientists who have done research on the Andamanese (the various indigenous peoples of the Andaman archipelago) were inundated with international calls, and so were anthropologists and social scientists who have spent time on the islands. The story of anthropologist Madhumala Chattopadhyay, who had contacted the Sentinelese tribe decades ago as a young researcher with the Anthropological Survey of India, was avidly shared across the media. The world may have its reasons for wanting to know more about the Sentinelese, but having seen the decimation of one ancient neighbouring tribe after another—from the Great Andamanese to the Jarawas and the Onge—the Sentinelese have even more reason to want to have nothing to do with the rest of the world. Before answering questions about the Sentinelese with the information and data that we currently have, we need to set the context. There are 7.7 billion humans living in the world today. Less than 700 of them belong to the ancient tribes of the Andamans. Out of this, the Sentinelese account for about 70; the Onges, about 100; the Great Andamanese, about 50 and the Jarawas, about 470—and all of them are on the edge of extinction because of outsiders who have taken over their land and resources ever since the British empire established a harbour and a penal settlement at Port Blair in 1858. So, if you imagine wild savages running around killing outsiders every time you hear of the Andamanese, or the Sentinelese in particular, nothing could be further from the truth because the hordes running around destroying ancient communities are definitely not them. Today, there are about 345,000 people on the Andaman islands, which means that for every tribal, there are nearly 500 others who have been brought to these islands from elsewhere—first by the British and, later, by the Indian government. The 160-year story of the “pacification", social disruption and attenuation of the Andaman tribes is a distressing and well-documented one. It is a story that is still being written, with the Sentinelese being the last ones standing, as they refuse to go down the path ultimately taken by the Great Andamanese, the Onge and the Jarawas—that of accommodation, often reluctant, with the intruders—after nearly a century of resistance. Today, it looks like the stubborn aloofness of the Sentinelese is the only thing standing between their survival and extinction. To understand how the Andamanese got to where they are and how they relate to the rest of their compatriots on the Indian mainland, we have to trace the tracks they have left on the sands of time. One of the striking facts about the Andamanese is that few other groups or tribes have ever had to face such consistently bad press for such a long time—almost two millennia, in fact. Ever since the rest of humanity took notice of them, they have been labelled savages and cannibals—though there has never been a shred of evidence of cannibalism among the Andamanese. The Ptolemaic maps of the 2nd century BCE (based on descriptions in the book Geography, written by the Greek astronomer and geographer, Claudius Ptolemy) showed nearly 1,500 islands on either side of the Malay Peninsula and most of these were supposed to be inhabited by cannibals, writes archaeologist Zarine Cooper in her paper, Analysis Of The Nature Of Contacts With The Andaman Islands During The Last Two Millennia. Two Arab travellers from the mid-ninth century wrote thus: “…the people on this coast eat human flesh quite raw, their complexion is black, their hair frizzled, their countenance and eyes frightful; their feet are quite large and almost a cubit in length; and they go quite naked." The Tanjore temple inscriptions of Raja Raja Chola from the 11th century CE refer to these islands as Timaittivu or “islands of impurity" that are inhabited by cannibals. Over time, their reputation kept getting worse, with each new traveller building new calumny on top of old ones. Here’s a laughably ridiculous description by the 13th century traveller Marco Polo, who calls the islands Angamanian: “… all the men of this island of Angamanian have heads like dogs and teeth and eyes likewise; in fact, in the face they are all just like big mastiff dogs! They have a quantity of spices; but they are a most cruel generation, and eat everybody that they can catch, if not of their own race." Marco Polo never set foot on these islands, but that is not surprising. 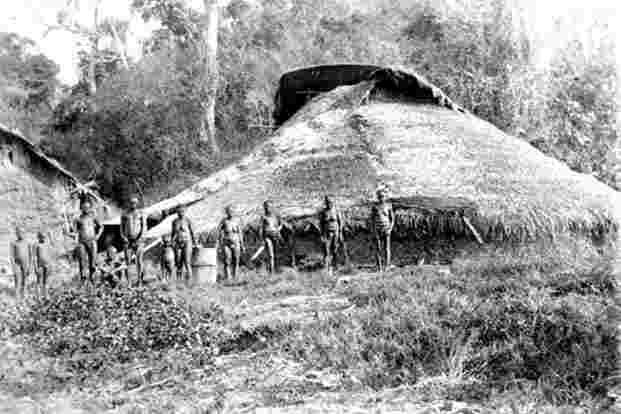 There are many who have written scandalously about the Andamanese without ever meeting them. What we know today is that while most travellers and early colonizers avoided the Andamans, people from South-East Asia used to make regular trips there to collect sea slugs and edible birds’ nests that are a delicacy for many in the region. So, it could be that those who were using the Andaman islands as a source of profit were spreading the word that it was a dangerous place where no one should go so as to prevent possible future competition for its resources. There is evidence to indicate that slavery was an integral part of the commerce. According to Maurice Vidal Portman, a British naval officer who was “in charge of the Andamanese", in his 1899 book A History Of Our Relations With The Andamanese: “Many of these (the slaves) were supplied to the Raja of Kedah (in today’s northwest Malaysia), part of whose tribute to the King of Siam (today’s Thailand) consisted of these slaves, who up to so late as 1860 are known to have been at the Siamese court." That may explain why the Andamanese today are so unusually hostile to outsiders: to avoid the risk of being captured and traded. “As indicated earlier, the consistent hostility of the Andaman islanders towards all foreigners was the inevitable outcome of being constantly preyed upon by Malay, Burmese, Chinese and European pirates to supply the demands of the slave market," writes Cooper. While there is no record of the Andamanese being cannibals, there is indeed record of them being hostile to all who arrive on their shores uninvited, to the extent of killing them. This includes people who were caught in shipwrecks and landed up on Andaman shores. Many of them were captured and killed and their ships thoroughly scavenged for all scraps of iron they could find. Iron was, and still is, a precious metal for the Andamanese, who tip their arrows and make their tools with it, but even this has not made them look out for trading opportunities with outsiders. Perhaps the occasional shipwrecks provided enough iron for their needs. 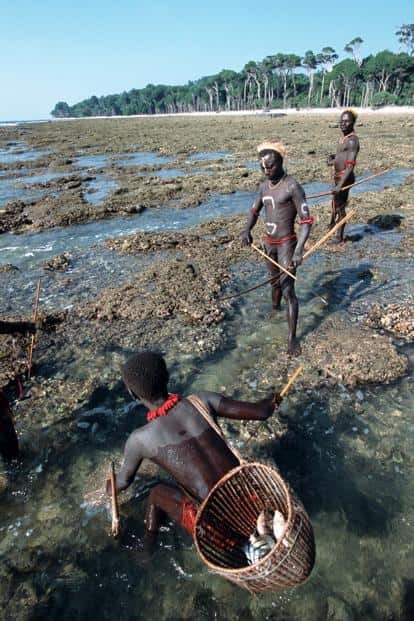 The Andamanese hunter-gatherers are not unique in their desire to keep themselves away from those who pursue a different way of life. There are many small communities like theirs spread around South-East Asia with similar physical features—short-statured, dark, with curly hair. Many of them live in isolated regions of countries like Malaysia, Thailand and the Philippines, away from the main farming populations, and pursue their hunter-gatherer lifestyle. Archaeologists, anthropologists and other social scientists have often hypothesized from this that these communities were the original inhabitants of South-East Asia, and that they were displaced or replaced by later, farming migrants from the Chinese heartland. These migrations were the result of the agricultural revolution in China which caused a population explosion—like it has happened wherever people took to cereal cultivation. If this is so, the hostility of the Andamanese to outsiders could be seen in another light: as the natural inclination of many hunter-gatherer populations to preserve and protect their way of life, in the face of new, teeming hordes of agriculturists arriving from elsewhere with an insatiable hunger for new land. If tribes like the Andamanese and the Semang (Malaysia), the Mani (Thailand) and the Aeta (the Philippines) were all the earliest inhabitants of South-East Asia, where did they come from and when? To answer that, we need to get a grasp of how the world got populated originally, something that genetic science has thrown new light on in recent years and about which I have written in my new book, Early Indians: The Story Of Our Ancestors And Where We Came From. We now know that all non-African populations in the world came from a single Out of Africa (OoA) migration around 70,000 years ago. Back then, a small subsection of the African population crossed over to Asia through the Bab-el-Mandeb strait that connects present-day Eritrea/Djibouti to Yemen, and then followed the coastline into India, before crossing over to Myanmar and then South-East Asia, East Asia, and ultimately, Australia. Archaeological evidence shows that these migrants had reached Australia by at least 59,000 years ago, and South-East Asia by 63,000 years ago. So they would have been in India by at least 65,000 years ago. Since India has seen multiple mass migrations after that, from both the west and the east, it would be appropriate to call these first arrivals the First Indians. So, could the Andamanese—as also the Semangs, the Mani and the Aeta—be direct descendants of these First Indians, who went on to populate South-East Asia, East Asia and Australia? The first genetic studies to answer this question were published in 2003. That year, two research papers, one lead-authored by Kumarasamy Thangaraj of the Centre for Cellular and Molecular Biology, Hyderabad, and the other by Phillip Endicott of the University of Oxford, came to broadly similar conclusions. “Our data…suggest that they (the Andamanese) are the descendants of the early Palaeolithic colonizers of southeast Asia," says Thangaraj in his study. The findings of Endicott’s study were similar to those of Thangaraj’s. In other words, the Andamanese were indeed part of the original OoA migration that came through India sometime after 65,000 years ago. We know today that the ancestry of these First Indians still forms 50-65% of the genetic inheritance of modern Indian population groups. The Andamanese, who are descendants of First Indians, have not, by and large, mixed too much with others. This means they could be one of the closest relatives in the world today of Indians on the mainland, though a separation of tens of thousands of years would have caused evolution to take place along different pathways. The results of the two studies mentioned above were based on comparisons between the mitochondrial DNA (mtDNA) data of the Andamanese and population groups from the Indian mainland. MtDNA is genetic code passed on from generation to generation through the maternal line, i.e, from mother to daughter (just as Y-chromosome is passed from father to son to son and so on). If a woman has a genetic mutation that causes her mtDNA to be different from her mother’s, then her daughters will also carry the mutated mtDNA. The same holds for Y-chromosomes, too. When mtDNA or Y-chromosomes are passed on in this manner—that is, any mutations that may have occurred within each lineage in the past are passed on—it is possible to identify different mtDNA family branches (or “haplogroups", to use a genetic term) with different kinds of mutations. The two studies mentioned above show that the Andamanese carried mtDNA haplogroup M2 and M4 that are common in India, but that the particular sub-haplogroup they belonged to, M31 and M32, are not found among groups in the Indian mainland, thus suggesting that these sub-haplogroups arose after the split between the mainland Indian groups and the Andamanese groups. The results of these two studies were fine-tuned three years later in 2006, when another research paper found that M31 was indeed present in mainland India. This would mean that migration to the Andamans could not have happened before the emergence of the M31 haplogroup, which has been dated to around 29,000 years ago (geneticists are able to date the age of particular haplogroups). One cannot rule out the possibility that the population split earlier and M31 crossed back into India, say, from South-East Asia, but taking all factors into consideration, a split after 29,000 years ago looks more likely. 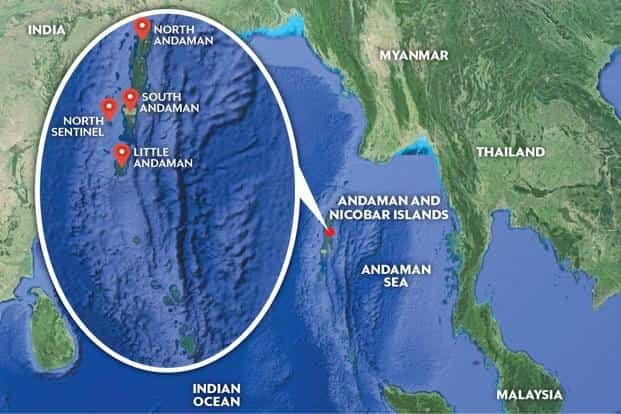 The study which looked at this issue exhaustively was published in 2008 and was titled Detailed mtDNA Genotypes Permit A Reassessment Of The Settlement And Population Structure Of The Andaman Islands. This study, authored by S.S. Barik, favours a late occupation of the Andamans. “Although this could have occurred anytime (since 29,000 years ago), the apparent ages of the Andaman-specific clades favours a chronology constrained within the last 10,000 years." So here we are, with the Andamans being settled probably sometime within the last 10,000 years, may even be as early as 29,000 years ago, by a branch of OoA migrants, who perhaps split off from the rest of the population of South or South-East Asia to occupy the islands. Archaeological evidence for human occupation of the Andaman Islands does not extend beyond 2,200 years ago partly because there hasn’t been enough excavations conducted. Therefore, this is the best approximation we can have as to when the Andamanese reached the archipelago. This small group of OoA migrants occupied different parts of the same or different islands of the Andaman archipelago—the Great Andamanese in the North, the Jarawa in the South and Middle Andaman, the Onge in the Little Andaman island and the Sentinelese in the North Sentinel island—thus giving the Andaman population a substructure, with the Sentinelese, Onge and Jarawa sharing many common practices and features. And then around 2000 BCE, farmer migrations originating in the Chinese heartland overran East Asia and South-East Asia, mixing with, replacing or marginalizing the original inhabitants of the region—such as the Semang, the Mani and the Aeta and perhaps others too who no longer exist as identifiable and coherent communities. The Indian mainland too saw multiple mass migrations from West Asia, Central Asia and East Asia between 7000 BCE and 1500 BCE, which resulted in a mixing-up of the existing population there. The secluded existence of the Andamanese lasted until the British arrived for the first time in 1789, looking for a safe harbour where their naval fleet could refit and escape to in the event of conflict with enemies. The rest of the story is best told through numbers. In 1858, when the British came to make a second and successful attempt to build a harbour and a penal settlement, there were around 5,000 tribal people in the Andaman islands, divided into four fiercely independent tribes protective of their land. Today, there are just over 700 of them. We are close to the elimination of an ancient population. Tony Joseph is a former editor of BusinessWorld and the author of Early Indians: The Story Of Our Ancestors And Where We Came From, published by Juggernaut this month.